We were wondering the other day (on the most recent episode) what the deal with the Mirrormere was. The story goes that Durin, dwarf-father, once beheld in the lake on an eastern slope of the Misty Mountains his own reflection, yet glorified, with a crown of stars. Thus, he saw a confirming sign, and the glories of Khazad-dûm would became a reality. Yet where did the vision in the lake come from? Indeed, where did the mystical properties of the lake come from? Valar? Elves? Ilúvatar himself? In “Mythopoeia“, Tolkien concerns himself with a meditation on the latent nature of reality. It is in some ways an expansion of Tolkien’s “On Fairy-stories” idea of not so much with WHAT IS, but with WHAT IS MEANT TO BE. Modern man has surrendered to brute fact, contenting himself, at best, with the trifles truest to his basic nature. Yet in the subcreative vision, which so many suppress, he is reminded of his elvish calling, of the magic that may be. Man is capable of music, that which, in Tolkien’s world (and I’d argue in our own) underlies all of reality (yet is invisible to those who dwell only on the brute fact of things). Yes! And the birds and the elves both laugh at us, for in the tree, they behold so much more. It is the bird’s natural union with the tree that leads it to do so, but it is the elves’ wonder that causes them to laugh. For in Lothlórien, they live not only among the trees, but in them, in glorious dwellings that crown them. The subcreative vision looks within a thing, to the essence of not only what it is, but what it might become. It is beholden to the dim reflection, the crown of stars hinted at only for the eyes open to wonder. For me, the last section of Tolkien’s On Fairy-Stories makes the slog that is the first half quite worth it. Tolkien’s exposition of eucatastrophe, “the happy turn” in a story, is unforgettable, an idea that has been expounded in countless places by numerous writers. Eucatastrophe is Tolkienian through-and-through. Not only is it a beautiful idea, but it’s a beautiful word as well. Things get really wonderful when Tolkien speaks of the Birth of Christ – the Incarnation – as “the eucatastrophe of Man’s history.” Why does he say this? Tolkien was obsessed with the hopelessness and darkness of mankind’s case in the ancient world, something he probably picked up from his deep interest in mythology. In the Incarnation, man is re-directed towards his ultimate destiny as the benevolent viceroy of the cosmos, the blessed bridge between the heaven and earth. The Incarnation is eucatastrophe because it is a surprise; like the appearance of the Eagles in various eucatastrophic moments of the Third Age, Christ first comes amid a desperate situation. Yes, the Jews hoped for a Messiah, but every indication is that they were looking for a great prophet and a warrior-king, one who would restore the kingdom of Israel to its Davidic pinnacle. Who would have thought that God would choose to draw so near to us as to become like us “in every way except sin,” indeed to renounce all of His rights as God in order to show us the beauty and triumph of the way of humility? 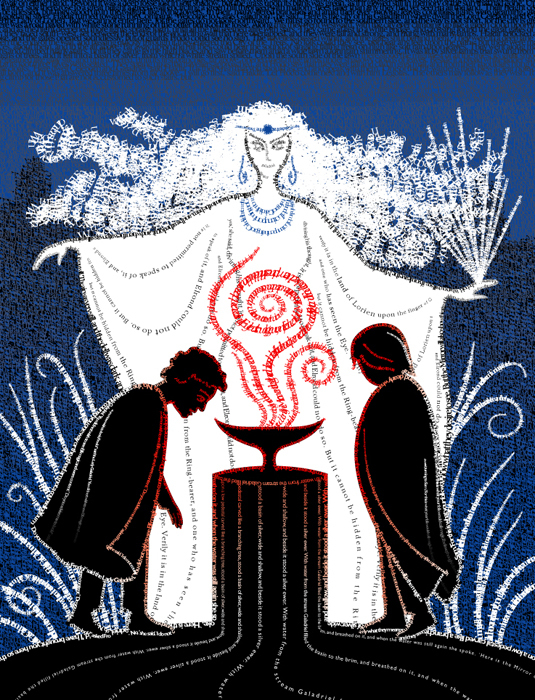 It seems that Tolkien was so intent on this idea that he worked it into The Lord of the Rings, for it is on March 25th, the traditional date of the Annunciation , that the One Ring is destroyed. And this is important: the One Ring is not finally destroyed by any Man, nor indeed by any hobbit, but by the invisible hand of the storyteller at work behind the scenes. Tolkien sets things up so that none of the three figures present  can claim credit for its destruction in the final analysis. No, the creature cannot save himself, not without divine aid, and though the great soul of the lowly hobbit is a sign of the greatness of humility itself, we see here that the hobbit is not even capable of finally putting the greatest of evils to death, of plunging the knife into its very heart. Thus, we can see how fitting it is that Eagles are frequent instruments of eucatastrophe, for they represent the power and will of Manwë, the greatest of the angelic Valar. Their coming from the clouds is as the descent of a supernatural power. Ask any Christian you know that has spent time dwelling upon it: the Incarnation is magical as a fairy-tale, and all the more so because we believe it to be as true as the fall of Rome. It is the wondrous event at the heart of everything, and yes, we mean everything. It is a thing wonderful to behold and to ponder. I get all misty-eyed when I think about it, and for good reason, for in it, we glimpse the mysterious ways of God Himself, saving and surprising us despite ourselves, drawing us ever closer to the deepness of a love vast as the cosmos. 1 – Subtract 9 months from December 25th and what do you get? More here. 2 – Frodo, Sam, and Gollum. While Gollum is ultimately responsible on an operative level of destroying the One Ring, he certainly does not will its destruction. Hey there fellow travelers! Welcome to The Tolkien Road, a long walk through the works and philosophy of J.R.R. Tolkien. On this episode, we continue our discussion of The Lord of the Rings with Book 1, Chapter 10 of Fellowship, “Strider”, wherein we learn more about the mysterious Ranger, receive Gandalf’s letter, and find out about Merry’s run in with the Black Riders. We also discuss the wonderful “All that glitters is not gold” poem. By the way, if you haven’t already, please leave The Tolkien Road a rating and feedback on iTunes. We’d love to know what you think of the podcast. Enjoy the show!